The Sila Grande and the Sila Piccola were already part of the Calabria National Park, as well as the other areas located between the two. How to Get There: Rome to Cosenza approx. 525 km. By car: A1 toward Napoli- A30 to Salerno-Reggio di Calabria- from the North, the Park can be reached from the highway A30; from the South from the freeway SS 106. For SILA GRANDE: from the North, take the highway A3 to the Cosenza exit, then take freeway SS 107 (E 846) towards Camigliatello, then take the freeway SS 177 towards Cupone. From the East, take the freeway SS 106 towards Mirto Crosia and then towards Longobucco. For SILA PICCOLA: from the North, take the highway A3 to the Cosenza exit, then follow the freeway SS 107 towards Silvana Mansio-Lorica to the freeway SS 179 for Gariglione. From the East, take the freeway SS 106 towards Crotone, then take freeway SS 107 towards Crotone and then Lago Ampollino. In Brief: Established in 1968, the Calabria National Park is the youngest of the so-called historic parks. 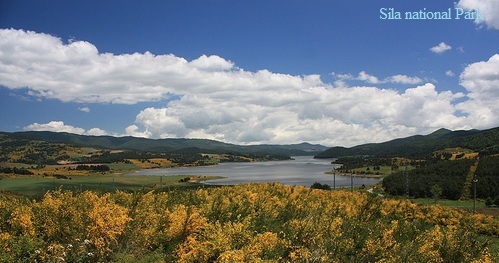 While waiting for its name to be changed to Sila National Park and for its new borders to be established, the Park continues to be managed by the Ex-ASFD (Former Agency for State Forests) and the old borders remain in place. There are numerous structures and pathways that are for the most part accessible to a large number of visitors. In particular 14 out of 17 locations, offices, nature areas, information centres, botanical gardens, etc., are accessible to visitors with mobility limitations such as elderly people, children and people with disabilities. Park Outline: The institution of the so-called Calabria National Park in 1968 (in reality, simply a combination of three pre-existing State owned forests that are located far-apart from each other), did not satisfy Italian environmentalists who considered it to be a mere façade. When the two distinct parks of Aspromonte and Sila were established between 1994 and 1997, they were enlarged to also include other important neighbouring territory. The Calabria National Park - Currently encompasses two distinct areas. One is in the province of Cosenza (Sila Grande), the other is in the provinces of Catanzaro and Crotone (Sila Piccola). It also includes the territory between them that is of significant environmental interest or priority. The Sila is a low mountain chain (more like a series of plateaus than an actual mountain range), made up of sedimentary, metamorphic and magmatic rock. 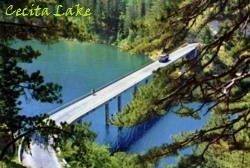 There are three artificial lakes in Sila Grande: The Cecita, Ampollino and Arvo. Two waterways also cross the landscape: the Cecita torrent and the Neto river. The main peaks are Monte Gariglione in Sila Piccola with a maximum peak of 1.765 metres and the Monte Pettina Scura in Sila Grande that reaches an elevation of 1.685 meters. The name Sila comes from the Latin word silva or forest, given because of the great wealth of trees in the area. 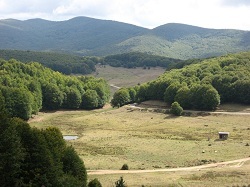 The Sila forests have been subjected to centuries of land use and abuse going back to Roman times and this has greatly changed their original characteristics. Despite so, they remain an important ecological heritage worthy of careful protection. Wildlife: The Sila forests appear very different in modern times than they did originally. The development of grazing land and agriculture, together with tree logging, has greatly depleted them. Nevertheless, they are still very attractive, both for their majestic Beech woods and for their centuries old Larch pine forests (a local variety of pine - seen mostly in the Sila Grande area). 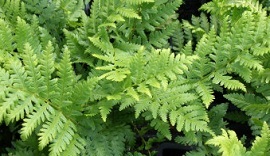 Male ferns grow vigorously in the understorey and are collected by florists and shepherds as a choice of wrapping for fresh cheeses. There are many species of botanical interest such as the Genista anglica, locally referred to as Ciciarella which is a geographically oddity as it can only be found in Calabria. It is unusual to find this plant in the heart of the Mediterranean because is a species that is typical of European Atlantic heathlands. The Sila is an extremely interesting oasis for wildlife. Many diverse species can be found here, including some rare ones or others that are at extinction risk; i.e. 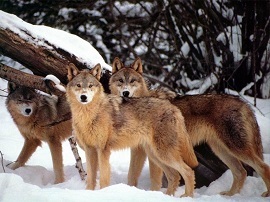 a good number of Apennine wolves live in the area. Small herd of Roe deer can be found throughout the Park, while the Red deer is currently part of a reintroduction programme. Wildboars can be found in the woods at lower elevations. Other mammals present in the Park are: Foxes, Badgers, Pine martens, Brown hares, Steenmartens, Weasels, Dormice, Red squirrels (called Zaccanella in the local dialect). There is a rich variety of birds including the rare Bonelli's eagle, the extremely rare Egyptian vulture (a small vulture), the Short-toed eagle, the Sparrow hawk, the Red kite and the Peregrine falcon. Nocturnal birds of prey include the Eagle owl, the Tawny owl and the Long-eared owl. 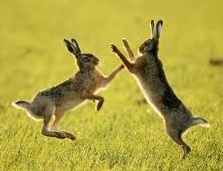 There are also Rock partridges, Quails, Snipes, Jack snipes and Great snipes that inhabit the grasslands. Black woodpeckers can be found in the forests though they are rare to the Apennine region. History and Culture: The Sila truly is - as described back in 1770 - the "Great Wood of Italy". 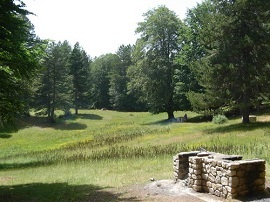 Virgil and Strabone praised the beauty and prosperity of its forests. The prehistoric peoples of the southern Apennine area, the Sibari and Bruzi, used its woods as did the Roman troops, the medieval church builders, the architects for Gregory the Great's Papal Palace in Rome, and the common shepherds and the people of Calabria. The intense and prolonged use of the Sila's natural resources left evidence on the nature and aspect of the Park's landscape. A skilled observer can immediately recognise how deteriorate the territory is, can recognize sheep tracks, the damage of deforestation and the young age of the forest trees; all these features demonstrate the need for proper management and reconstruction of the southern Italian mountain culture. The Park's boundaries exclude housing settlements and important monuments. 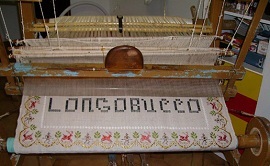 An exception is the artisan district of Longobucco, best known for is fabric industries, whose medieval character is highlighted by a 12th century bell tower. Beyond the Park's borders is the town of S. Giovanni in Fiore with the Parish House and the Badia Florense; Spezzano della Sila with Palazzo Monaco, the Church of S. Biagio, the Monastery of the Padri Minimi and the Church of Santa Maria delle Grazie. In Rossano, traces of the influence of the Greco-Byzantine culture can be seen in the style of the Churches of San Marco and Santa Maria del Patire and in the Codex Purpureus *, a sixth century illuminated manuscript housed in the local diocesan museum. 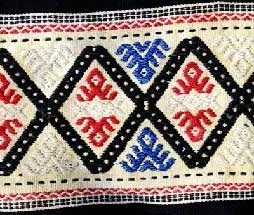 Typical Products and Craftwork: S. Giovanni in Fiore is a traditional fabric production area in the region, in particular producing oriental style rugs for which a specialized school has been set up with master craft men from Armenia. To a lesser degree, the area is also home to traditional gold working production. Within the Park's borders there is a location that masters a unique craft, using coloured pine cones (Grande Segheria di Cupone, near Cecita Lake). Area of Sila Piccola: Monte Gariglione: This is a two-hour route which leads to the peak of Gariglione (1765 m), starting from the Forest Station of the same name, located at an elevation of 1654 m.
Sila Piccola: A 5-6 hour hike that highlights the most interesting natural aspects of this part of the Park (grazing fields, woods, torrents). The route starts and ends a short distance from the Village of Trivolo, continues through Colle del Telegrafo and then meets up with the Peciaro torrent and the Tacina river. It also passes through the well-known Pulitrea forest. Area of Sila Grande: Segheria Cupone, Bosco del Corvo, Cozzo del Principe, Greenhouse: an easy, 4-5 hour long path that passes through some of the most beautiful areas of the Park reaching Ponte della Fossiata (Fossiata Bridge); from this point one can return to the starting point via a paved road that leads to the sawmill. Segheria Cupone, Quattro Vie, Serra Ripolata, Greenhouse: This is the longest and most strenuous route (5 to 6 hours). It thoroughly covers the natural areas of the Sila Grande. Check also " suggested Calabria Itinerary"